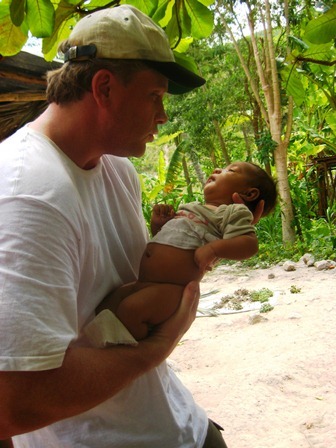 In 2002, Sean Forrest traveled to Haiti with a fantastic organization that provides medical services to some of the poorest people on the face of the earth. While in Haiti, Sean visited an orphanage and was moved by the heartfelt compassion and heroic efforts of the caretakers. It disturbed him to notice, however, that for most of the day the children had little activity or physical contact. The man who ran the orphanage told Sean he would be wise to avoid picking up the kids because most of them had scabies — nasty little parasites that crawl under the skin. Just after the man spoke, a little boy of about four years of age came near and stood looking up at Sean. He didn’t put his arms up for Sean to hold him because his experience had taught him that people simply did not. The boy’s arms were covered in powder, indicating a medication applied to the skin to help with scabies. For a moment, Sean stood there, hesitating in fear, but his heart was bursting. Sean had to pick Him up, for this little boy was Jesus standing in front of him. How could he tell Jesus that he couldn’t hold Him out of fear of contracting this sickness? The boy lit up when Sean held him, and he clutched Sean’s neck so tightly that it was clear he was going to stay for a while. Then Sean experienced one of the most overwhelming moments of his entire life. When the other children saw that he had picked the boy up, they all ran at him and were holding their arms up, just dying for some love. Sean tried desperately to hold them all, as he fell to his knees and just put his arms around as many as he could. It was so sad, but infinitely beautiful at the same time. Before Sean left the orphanage, he entered another room that housed children who were too sick to get out of their cribs. There was a little girl, about one year old, who was suffering so badly from encephalitis that her head was swollen to twice its normal size. This illness can often be treated with basic drugs, but this poor child did not have the opportunity to receive them — or even vitamins or proper nutrition. Sean quietly held her in his arms and listened to her shallow breathing, realizing that she was dying. She would probably be dead in the next few days, and there was nothing he could do for her but pray. When he got back to where they were staying, he fell apart and wept in his room. There are so many. So many Haitian children who are sick and dying and feeling there is no hope and no one who cares about them. Yet, they still have an amazing faith in Jesus — the champion of the poor. When Sean got home to the States, he asked God to let him build an orphanage for the children of Haiti that would be a true home — with a dormitory to house many missionaries so that people could go to feed these little ones, hold them, and play with them. The problem was … how could this be done, with no land and no resources? With the help of an amazing team, Sean turned to what he had been doing for years — music and teen ministry. The team produced a powerful concert that raised $20,000 for the poor of Haiti, and then dedicated the proceeds of two summer camps to purchase the land and a home for an adopted Haitian family. The journey had begun, but there was so much to do. Sean spoke with a friend who also desired deeply to work with the orphans in Haiti, and she introduced him to a friend of hers from Haiti who also shared their vision — and he explained that his family was eager to help the team secure the land! 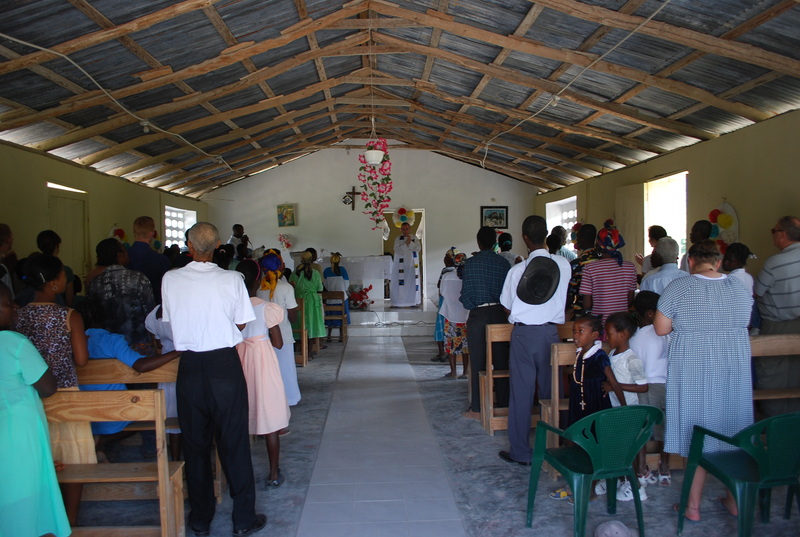 On the first trip to the village, there was a beautiful, faith-filled prayer service with 300 of the local villagers, some of whom had walked hours to attend! They wanted to be an integral part of this mission, through their sweat and hard work — not just receive a handout. Today, God continues to work through this mission to do things that would be impossible without Him. The orphanage is complete and bursting with happy children, the world-class school is full of life and learning, the chapel is a beautiful anchor for spiritual life in the village, and the medical facility is being built. Generous donors and the work of both the Haitian and U.S.-based teams are combining to help change the face of Haiti — to turn around the poverty in the island nation. May God’s will be done.